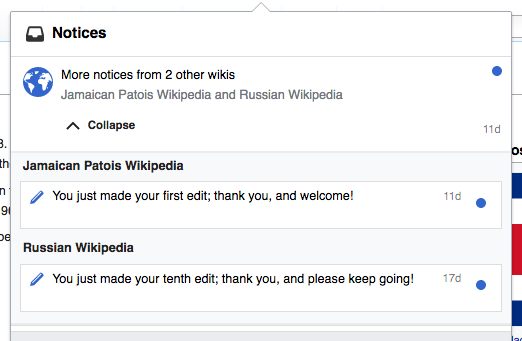 I can understand having a notification for your first edit, but having one for your 10th, 100th, etc. is just annoying. When we were originally developing Echo, we discussed the possibility of creating notifications for the 1st, 10th, 100th, etc. edits, but since the research conducted by the E3 team showed that such milestone rewards had no effect on editing behavior, we decided against implementing them. As there is no reason to believe that such notifications are actually useful, they are basically just spam (especially for editors active across all the wikis). I can understand having a notification for your first edit, but having one for your 10th edit is just annoying. When we were originally developing Echo, we discussed the possibility of creating notifications for the 1st, 10th, 100th, etc. edits, but since the research conducted by the E3 team showed that such milestone rewards had no effect on editing behavior, we decided against implementing them. As there is no reason to believe that such notifications are actually useful, they are basically just spam (especially for editors active across all the wikis). That research only covers 1,000th edit to the article namespace (that means even more than 1,000 overall typically). The user is engaged in a completely different way at their 10th edit (especially if it's their 10th edit to any wiki, in which case they're very new). It's not even the same ballpark. Treat new editors differently from established ones (may not be feasible right away). @Mattflaschen-WMF: That page is just one example, they also experimented with notifying editors on their 1st, 5th, 10th, 25th, 50th and 100th edits. None of those experiments had positive results from my understanding. And even if we were going to have such notifications, it would make a lot more sense to show them as post-edit messages than Echo notifications. Having to click an icon, wait 2 seconds, get a useless message and then clear the message is a waste of time. And since there's no way to turn them off, I just have to keep doing this forever (or at least until I've hit 100 edits on every wiki). Looking at the results from the PEF-2 experiment, it looks like editors who received such milestone notices actually ended up having higher revert rates and lower edit counts in the long run (although none of the results were statistically significant). Thanks, didn't know about any of these experiments. That experiment is based on a different UX and is not comparable to the feature we built. Allowing the few expert users that don't like it to disable it for themselves globally seems a much saner decision.